A lot of my friends cloth diapered their little ones. In the past I thought it was such a strange thing to do. I thought it would be gross and a lot more work. I have no problem admitting I was dead wrong. There are an insane amount of different diapers to choose from and when I decided I wanted to go cloth I was beyond overwhelmed at first. Thanks to a lot of great advice from friends and reading a million reviews online I chose the ones that I thought would be best for my family. The main ones to chose from are prefold, fitted, pocket, all in one, and hybrid diapers. Thanks to the variety I honestly feel that there is a diaper that would work for anyone. 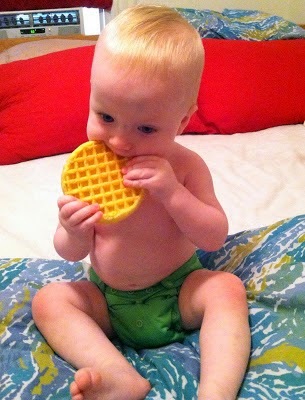 We used Bumgenius 4.0 one-size with snaps and loved them! They have to be the easiest of all cloth diapers. They have a pocket you stuff an insert into and it all just gets thrown in the wash. The one size part means that they work at all ages. They snap into a small size and unsnap to a larger size so your baby can use them right up until they are potty trained. I feel like you really get your money's worth that way rather than having to buy ones they will just grow out of. We chose snaps instead of Velcro because they tend to last longer and its harder for toddlers to figure out how to undo them. We had 19 of these in several colors but it wasn't quite enough since we didn't have a dryer. We later ordered six Econobum one-size and that was plenty. These are different because it's just a cover that you lay the prefolds in. These I used only at home and never over night because they don't have the same hold as the Bumgenius ones. What's great about them is that I could use the cover for several changes because all I had to change is the prefold. The prefold that came with them was too thick for now so I just use the inserts from the Bumgenius. They also are much cheaper. The Econobums are about $12 and the Bumgenius are about $18. As far as the washing part goes, it couldn't be easier! We had a garbage pail next to the changing table lined with a Planet Wise diaper pail liner. Every other day I would throw it all in the wash and use Bumgenius diaper detergent. I always washed it in hot and would do an extra cold rinse at the end to make sure all the detergent was out otherwise it starts to build up and smell funky. I would hang it all to dry and stuff the pocket diapers while watching TV at night. It might sound like a lot of extra work but I didn't find it burdensome at all. You're doing tons of laundry anyway, so what's an extra load? They can stain sometimes but all you have to do is lay them on the grass in the sun and they will be good as new in a few hours. When your little one gets older you can get a diaper sprayer to take care of larger messes before you throw it in the wash. I also used cloth wipes that I sprayed with a solution made of water, California Baby body wash, and tea tree oil. Cloth wipes makes it so much easier because you can just throw them in with the wash rather than separating them from the diaper to throw them out. Cloth diapering is worth considering because it's better for your baby, better for the environment and better for your budget. This site goes in much greater detail. When my son was born he was 7lbs 11oz. but most cloth diapers work best starting at 8 or 9 pounds so we used disposables at first. While using them he had two minor diaper rashes but once we started the cloth he didn't have any. We still used disposables sometimes when we traveled so it was less to carry around. My son, Wolf in his Bumgenius diaper.